Plus you can still get a 4K Apple TV or Amazon Fire Stick. Heads up: If you’ve been considering cutting your cable subscription and replacing it with a live TV streaming alternative, there are crazy good DirecTV Now promos going on now. The short version? You can get a $180 Apple TV 4K for just $105, and that price includes three months of DirecTV Now. If you don’t need a streaming box, you can also get the service for $10/month for the first three months, saving you $75. Finally, if you’re an Amazon household, there’s a good Amazon Fire TV promo going on now too. For those not caught up, it’s been pretty painless to drop cable for some time now, replacing it with Netflix, Hulu, and so-on. But the one thing missing was watching TV live as it aired, which mattered for big sporting events and other key TV events. Services like DirecTV Now, Sling, and PlayStation Vue filled that gap by offering live TV streaming over the internet. The cost for one of these services + standalone services like Netflix + internet isn’t cheap, but it’s usually still considerably cheaper than a cable package, and has the added advantage of letting you watch on loads of devices, not just on a TV. Get the full scoop on all these DirecTV Now deals below. For a limited time, prepay for 3 months of DirectTV Now and get a brand new Apple TV 4K. If you sign up for the cheapest plan ($35/mo), that means you pay $105, total, for 3 months of DirecTV Now and the Apple TV. Right now, the Apple Store sells the Apple TV 4K for $180, so this is an insanely good deal. Alternatively, you can instantly save $25 for the first three months of DirecTV now. Choose which package you want and then apply the code YESNOW3 at checkout. Boom. You just reduced your costs by $25 a month. After the 3-month period is up, the price shifts back to normal, but if you decide you want to cancel, you’re free to do so at any time. Keep in mind, this special deal is stand-alone and won’t combine with any other deals, but at $10 a month for a load of great channels, it’s still an excellent bargain. Here are 4 really solid packages to fit your television-watching needs. If you’re the non-committal type, you can prepay for 2 months of DirecTV Now and get a new Amazon Fire TV 4K. At the cheapest plan ($35/mo), you’re only paying $70 total for both 2 months of DirecTV Now and the Amazon Fire TV. Amazon sells Fire TV alone for $69.99. you can cancel your service before the auto-renewal, The good news is your Apple TV or Amazon Fire TV is yours to keep indefinitely. 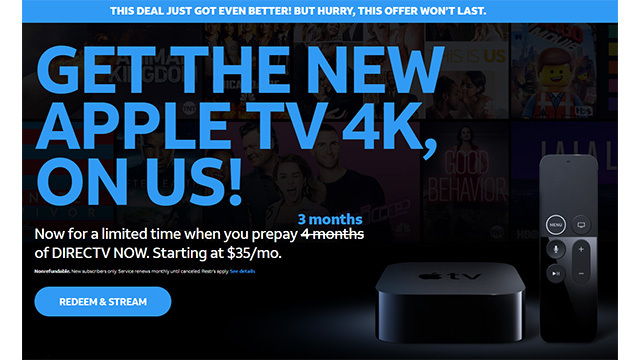 The deal is limited to new DirecTV customers only, with a limit of one Apple TV or Amazon Fire TV per DirecTV Now account and two Apple TVs or Amazon Fire TVs per shipping address. Your Apple TV or Amazon Fire TV will be shipped via FedEx and arrive in 2-3 weeks. Seth Macy is a writer and connoisseur of deals. Follow him on Twitter @sethmacy.